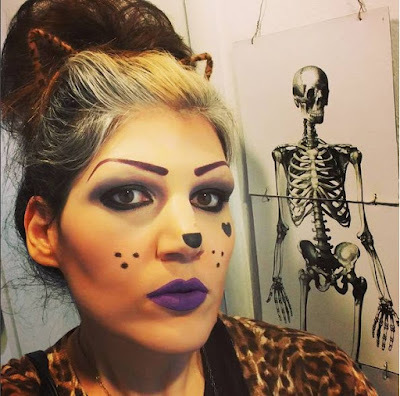 I tossed together a cat costume with stuff I had in my closet. Everyone needs a pair of cat ears in their closet! Mady was a Death's Head Moth (as seen on Silence of the Lambs). 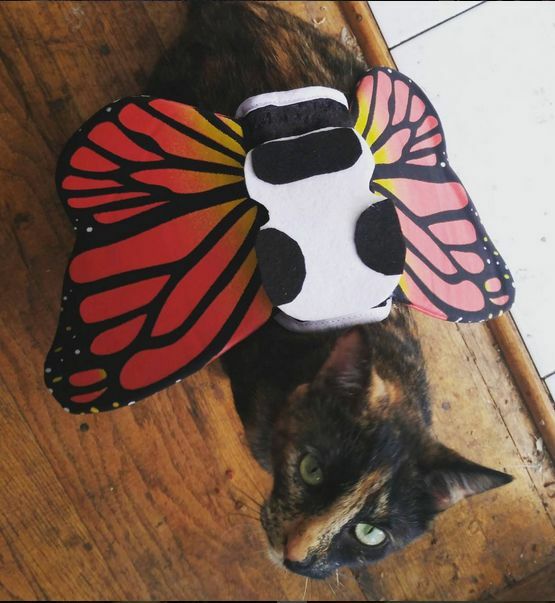 She did not like the costume much so getting a good picture was rather hard but I tried! Matt gave me the idea when we spotted wings at pet store but they were like $25. I looked online - found a cheap pair and made a skull out of craft felt and attached it to the wings using double sided tape. This way come spring Mady can be a butterfly or something. Mortis had a costume but it did not fit him well. So Matt snapped this photo of Mortis with a pumpkin. Besides being catty Matt and I munched on vegan pizza and ice cream and spent time watching spooky shows and movies. I had a few kids at the door I gave candy too but each time there was a knock the cats got scared so I turned off the lights. Low key but nice - a winner! You and the kitties are so adorable! Your evening sounds delightful and much like mine. 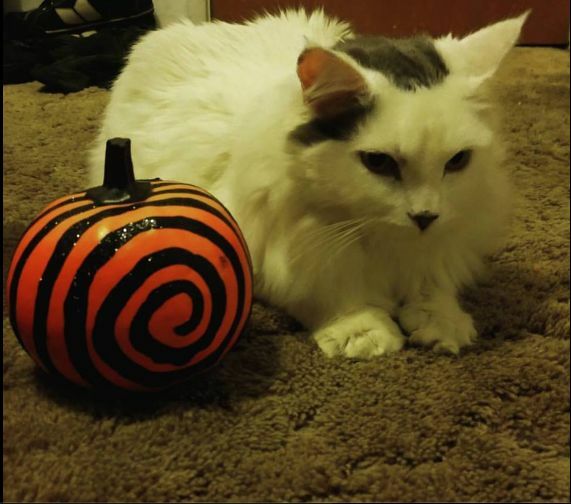 My cat also got scared by trick or treaters, but we only had about 15, so it wasn't too bad. Happy Halloween! Your costume is great and that's a really great pair of cat ears! I love Mady's costume and Mortis looks cute next to that pumpkin!